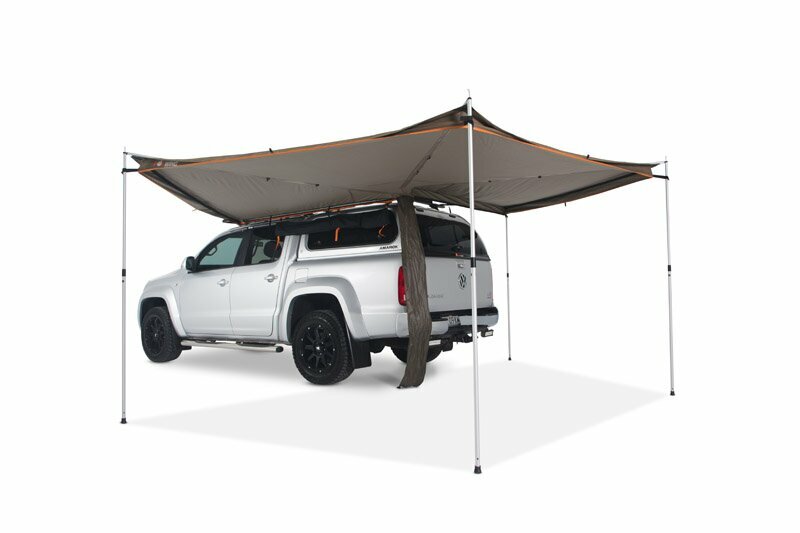 Back in 2007, Oztent changed the way we think about vehicle awnings when it unveiled the Foxwing, the world’s first commercially available, 270°, swing-out awning. 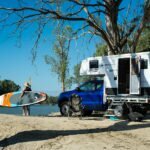 It’s had a few small updates since then, but none as comprehensive as the latest release, which ads far more functionality and versatility to the 4WD awning. Key to the new design is the bag, which can now fit all of the pegs, poles and ropes, so there’s no need to carry any of them in the car. Oztent has actually had the bag available as a retrofit to your old Foxwing for a few months, now, so it hasn’t come as any real surprise. 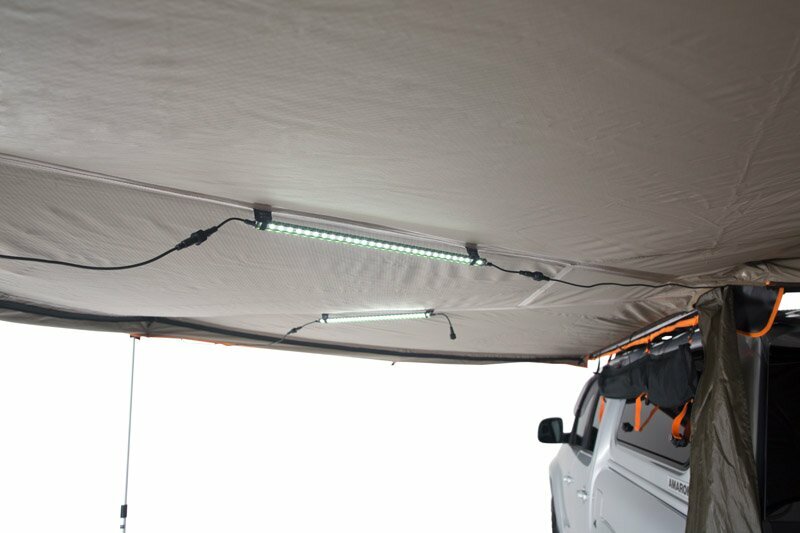 Another big improvement to the Foxwing is the addition of toggles which allow LED lighting strips to be hung from the underside of the awning. On older versions, campers have been forced to hang them from the poles or attach them to the car, but it wasn’t always the best spot. Another small change also improve visibility around the awning – the guy ropes are now reflective, rather than just orange. Oztent has also updated the fabric it uses – no longer is it a poly-cotton canvas blend, but a 100 per cent polyester fabric called ModCan, which Oztent says it developed for global markets and also uses on some of its tent products (like the RX-4and soon to be released RX-5). It’s a waterproof, fire-retardant, mould resistant and UPF100+ fabric, which I sort-of expect Oztent to slowly roll out on more and more of its products until the poly-cotton canvas disappears from use, although that’s all speculation. Oztent has also updated most of the accessories for the Foxwing, so the wall pieces now come in a pack of two and zip together, while the tapered wall pieces have also been tinkered with. 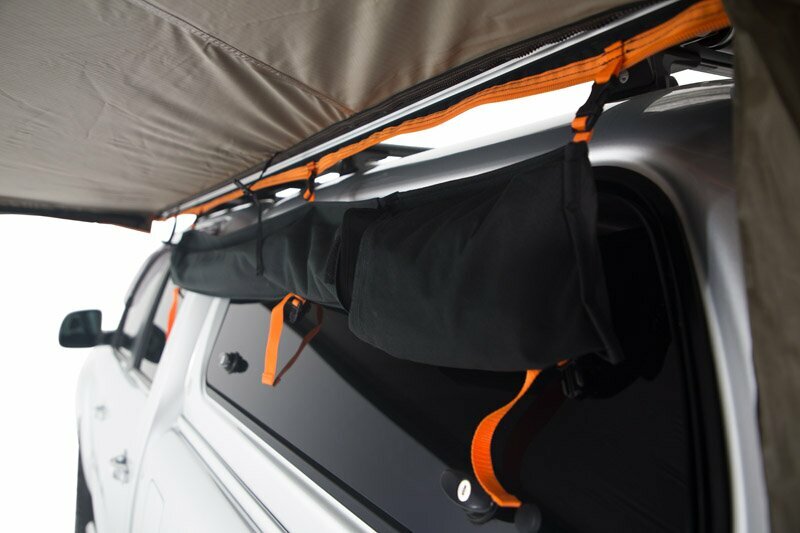 Notably, the addition of a vehicle wall panel means the Foxwing can be completely enclosed, while it also still maintains the ability to have any of the Oztent awnings zipped directly too it. We’re outside the realms of 30-second set-up by now, though. For all that, the new Oztent is only 200 grams heavier than the old one, and just $80 more expensive, which seems reasonable. 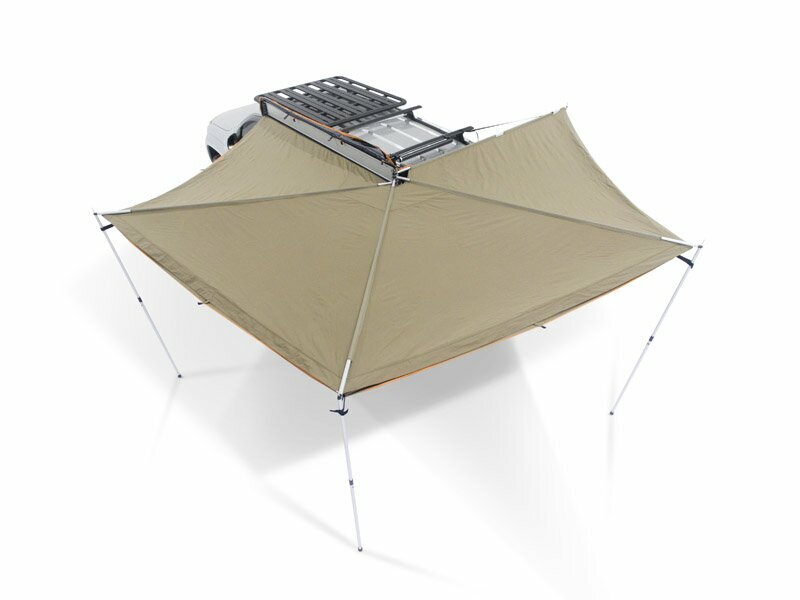 It gives 11m2 of shade and adds 18.3kg to your roof load. 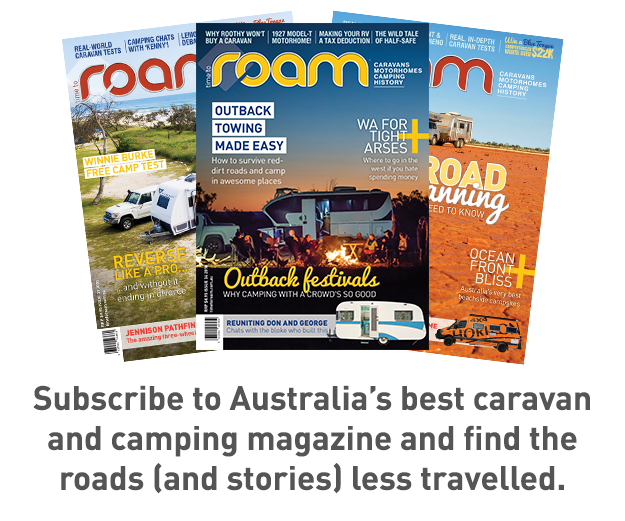 Find out more about it at oztent.com.